Consider the image below. It was created in 1952 by Alexander Leydenfrost for the 50th anniversary issue of Popular Mechanics. Clearly certain technological innovations yield this dizzying experience of Promethean shock more than others. The advent of human flight, the atomic bomb, and putting a man on the moon are just some of the more simultaneously startling, awe-inspiring, disconcerting examples. When these technologies arrived, in rather quick succession, they rattled and unsettled reigning cultural and moral frameworks, tacit as they may have been, for incorporating new technologies into existing society. These normative cultural expectations for technology were set, Misa suggests, during the “longer-duration ‘eras'” of technology which he identifies in his history of the relationship between technology and culture. These eras included, for example, the age of the Renaissance, when the demands of Renaissance court culture set the agenda for technological change, and the age of imperialism, when the imperatives of empire dictated the dominant agenda. The former era, in Misa’s analysis, spanned nearly two centuries, and the latter the better part of one; but the 20th century is home to at least four different eras, which Misa labels the eras of systems, modernism, war, and global culture respectively. His brief illustration of this development is initially compelling. Two centuries elapsed before the Renaissance was named. Within 50 years of the appearance of factories in Manchester, the phrase industrial revolution was in usage. Just four years after the telephone arrived in Moscow, Chekhov published a short story, “On the Telephone,” about the travails of an early adopter trying to make a restaurant reservation over the phone (fodder for a Seinfeld plot, if you ask me). Most recently, William Gibson gives us the term cyberspace “almost before the fact of cyberspace.” This sequences suggests to Misa that Western society has become increasingly self-aware of technological change and its consequences. I think this claim has merit. The Modern mind that, according to Auden “cannot understand/what it can clearly do” he described as the “self-observed, observing Mind.” But, again, we might be tempted to ask why our “self-awareness” is accelerating in this way. Might it not be attributed, at least in part, to an increase in the rapidity of technological development? The two seem inseparable. I’m reminded of Walter Ong’s dictum about writing: “Writing heightens consciousness.” In a slightly different way, might we not argue that technological change heightens societal self-awareness? Consider again that Leydenfrost image above. It captures an important aspect of how we’ve come to understand our world: we have aligned our reckoning of the passage of time with the development of technology. We have technologies that mark time, but in another sense the advent of new technologies mark time by their appearance, iteration, and obsolescence. Human beings have long sought markers to organize the experience of time, of course. For a day sunrise and sunset served just fine. The seasons, too, helped order the experience of a year. For longer periods, however, cultural rather than natural markers were needed. Consider, for instance, the common practice in the ancient world of reckoning time by the reigns of monarchs. “In the x year of so-and-so’s reign” is a recurring temporal formula. Without achieving that sort of verbal formality or precision, I’d suggest that the development of technology–the reign, if you will, of certain technologies and artifacts–now does similar work for modern societies. Records, 8-tracks, tapes, CDs, MP3s. Desktops, laptops, tablets. Landline, portable landline, cellphone, smartphone. Black and white TV, color TV, projection TV, flatscreen TV. Pre-Internet/post-Internet. Dial-up/broadband/wireless. I suspect you can supply similar artifactual chronologies that have structured our recollection of the past. We seem to have synchronized our perception and experience of time to the cycles of technological innovation. 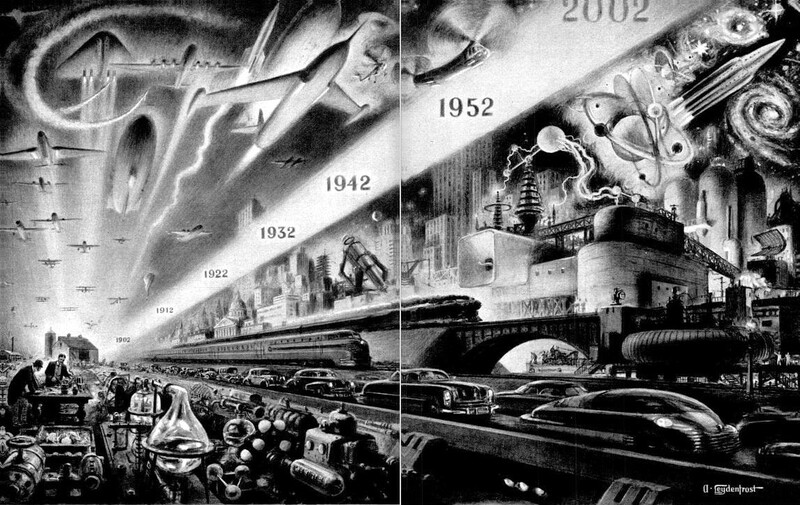 The Leydenfrost image also reminds us that insofar as the notion of progress exists at all today, it is clearly bound up with the advance of technology. All other forms of progress that we might imagine or aspire to– moral, economic, social–these are subsumed under the notion of technological progress. For that reason, rumors or suggestions that technological innovation might be slowing down unnerve us. We need the next big thing to keep coming on schedule, however trivial that next big thing might be, to distract us from our economic, political, and personal woes. The world may be falling apart around us, but we can bear it so long as we can project our hopes on the amorphous promise of technological advance. The prospect of a host of Promethean shocks that we seemed poised to receive–from drones, robotics, AI, bioengineer, geo-engineering, nanotechnology–makes us nervous, they unsettle our moral frameworks; but their absence would worry us more, I suspect. Thank you for your posts. Effective writing is greatly needed during this time of our history. If you challenge that last statement, and it deserves much discussion, you have to be willing to assert that technology is able to create and solve new human needs and therefore is changing us. And then you get to debate what exactly are human needs! Well written piece. In the end I believe it all comes down to intention, the tools change according to the place in time – its the intention behind the people using the tools that determine our future. Your last paragraph is really powerful and definitely describes my reaction to technology. Before I worked in high tech, I was so anti technology (especially biotech/pharma) because of the very moral issue you discuss, but mostly because I feared the consequences of little kids playing with matches. The fire quickly gets out of control before you can put your hands on the fire extinguisher, let alone press down. That said, without technology I fall into a dark hole of despair about our future. And realize that technology is, indeed, our only hope at rectifying the damage already done. I think many of us, and possibly Americans most of all, assume that technological innovation is synonymous with progress. Thus, to suggest that technological innovation is slowing down would mean that by simply standing still in a technological sense would actually mean that we were moving backwards. This same anxiety over technology/progress is, I believe, what makes us invested in believing that technology is advancing ever faster and faster — and why we are eager to divide the 21st century into 4 eras. Great post! I would see Terence McKenna and David Cronenberg are among the greatest thinkers on these subjects. “The world may be falling apart around us..” Yes, there is a popular perception of the world falling apart, but surely there is also a lack of popular shock about technology. By now we were supposed to have flying cars and living on Mars and beaming free energy from outer space. Surely the shocks disrupting a more comfortable post-WWII view of the world have had to do with economic and political developments, like the shift of industrial work east and the political decision to embrace poverty, unemployment and financial insecurity instead of regarding them as evils that society must organise itself to guard against. Sending the mounted police to attack the “enemy within” was far more of a shock for some of us than the news that someone somewhere had cloned a sheep.